We have completed a comprehensive status review under the ESA for the orange clownfish and we determined that, based on the best scientific and commercial data available, the orange clownfish does not warrant listing under the ESA. We conclude that the orange clownfish is not currently in danger of extinction throughout all or a significant portion of its range and is not likely to become so within the foreseeable future. The NMFS Pacific Islands Regional Office (PIRO) undertook the response to the petition to list the seven Indo-Pacific species of damselfishes, while the Southeast Regional Office (SERO) undertook the response to the yellowtail damselfish, the only species not native to the Indo-Pacific. Last September, NMFS published a positive 90-day finding for the orange clownfish and a negative 90-day finding for the six other Indo-Pacific damselfishes. This past February, NMFS announced a negative 90-day finding for the the yellowtail damselfish. A positive 90-day finding (I covered the orange clownfish positive 90-day finding for CORAL Magazine) indicates that NMFS finds that a petition itself presents “substantial scientific or commercial information indicating the petitioned action of listing may be warranted.” In the words of an NMFS source, a positive 90-day finding is “a very low bar.” Any positive 90-day finding results in a status review, during which NMFS conducts extensive research into the species. 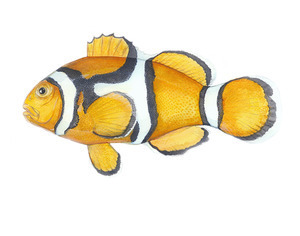 A 12-month finding, such as the one published today in the Federal Register for the orange clownfish, is the end result of the status review. In the course of the status review, NMFS looked specifically at 12 identified threats to the orange clownfish including destruction, modification or curtailment of the species’ habitat or range; over-utilization for commercial, recreational, scientific or educational purposes; disease and predation; inadequacy of existing regulatory mechanisms; and other natural or manmade factors affecting the species existence. When reporting on NMFS’s decision to undertake a status review for the orange clownfish, many popular media outlets focused almost exclusively on the affects of the marine aquarium trade on the species. Some claimed that overfishing and destructive fishing for the aquarium trade were threatening the species. A few outlets published data that was either out-of-date, misleading or flatly incorrect showing that the aquarium trade was potentially over-harvesting the species. Considering the estimated proportion of the population harvested annually, the principles of fisheries management and population growth, the ease and popularity of captive propagation of the species, and the apparent consumer preference for captively-reared fish for home aquaria, we have determined that overutilization due to collection for the aquarium trade has a low likelihood of contributing significantly to the extinction risk of the orange clownfish now or in the foreseeable future. Stay tuned for further analysis here at The Good Catch Blog and at CORAL Magazine. This entry was posted in Aquaculture, Endangered Species Act (ESA), Indo-Pacific, Ornamental Fisheries and tagged Amphiprion percula, Endangered Species Act, nemo, NMFS, orange clownfish. Bookmark the permalink. Good news Ret. Thanks again for thorough reporting. It’s good to see data-centered decisions! Thanks for keeping us informed, Ret.